Water levels in the marsh are quite high this spring. This week I had the opportunity to go out with New York State Department of Environmental Conservation staff when they put in nesting platforms for Black Terns. Black Terns are listed as Endangered in New York. Statewide breeding bird counts are conducted every three to four years for this species and several habitat management activities are ongoing in the state. Black Terns build very fragile floating nests that are often vulnerable to flooding. In certain circumstances nesting platforms are placed in marshes to encourage Black Tern to nest and to enhance nesting success. Water levels in the marsh that we were paddling in is controlled by a water control structure, which had "help" from a beaver so some sticks and mud had to be removed. The debris was blocking the water flow outlet, causing the water to be higher than it usually would be in the spring. That has been cleared, but the water levels were still high. Nesting platform for Black Terns with some "muck" on it. Now enter the platforms - these structures, are comprised of a 16” X16” square made of firring strips with hardware cloth stapled in the middle. The platforms are anchored by using a rope and heavy weight. They are a good substitute for the cattail mats or other substrate that is necessary to make a nest. We added a little "muck" on top (mud, mixed with parts of cattail and other vegetation) and you have the perfect spot for a Black Tern to make their nest. Success! Beautiful day, beautiful weather and a chance to do good work for an Endangered species. Nice work giving a helping hand! My day started as it normally does. Get my son out he door to the bus and then get going with the day. Our dogs must be walked each morning or they will pester me and not let me work. So out the door we go, to go for a walk in the woods, camera in hand. 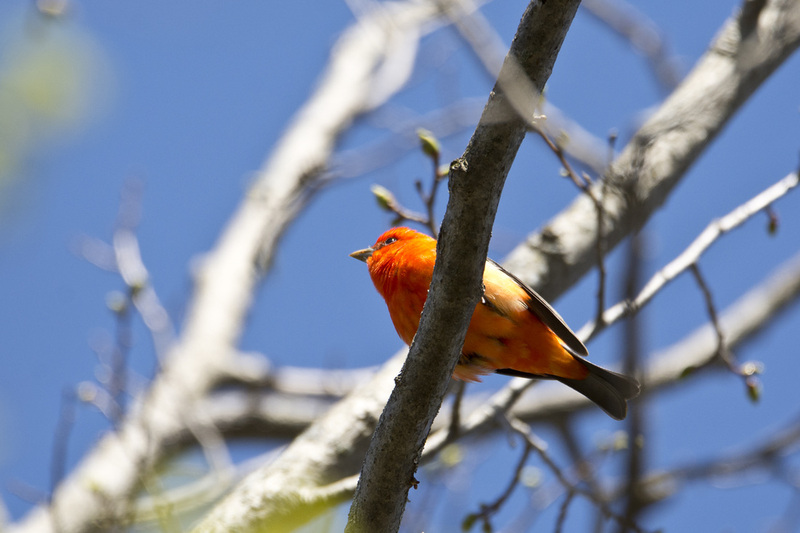 Today the surprise was a male Scarlet Tanager who happened to catch my attention, high in the trees. As the leaves open more he will be harder to spot, but now, with the buds just beginning to open, his scarlet feathers stand out against the grays of the branches and the blue of the sky. Spring is most definitely here and many of our feathered friends are back! And now on to working on the OBI newsletter. It will not write or format itself!